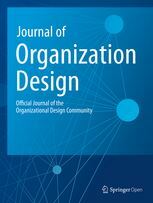 The Journal of Organization Design (JOD) is an official publication of the Organizational Design Community published by SpringerOpen. JOD's mission is to publish theoretical and practical articles on all aspects of organization design. JOD is particularly interested in publishing articles that are future oriented. JOD has a distinguished editorial board and a double-blind review process, ensuring that the journal maintains rigorous scientific standards and publishes high-quality work. It is an open access journal, meaning that it is self-published by the Organizational Design Community and available online to all interested parties. Everyone interested can also submit their article for the journal, get it reviewed and possibly published. JOD is covered by the major abstracting and indexing services so authors’ work is widely available. The editorial team of JOD is committed to conducting a prompt review and editorial process so that authors are able to publish their ideas and findings in a timely fashion. For a complete description of Journal of Organization Design or to sign up for authoring, please visit the journal website. The following section provides general information for authors about the manuscript submission process. Journal of Organization Design supports ORCID. Sign up for the publishing notification service for this journal.